All WowMoms need a getaway and I found just the place. The Beloved Hotel is a hidden gem in Playa Mujeres, just north of Cancun. 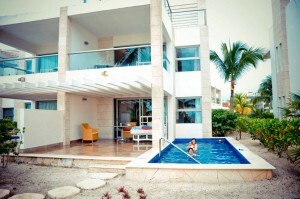 This five-star all-inclusive boutique hotel is for the mom who loves luxury and kid-friendliness all rolled in one. My hubby was skeptical when he saw pictures of the all-white decor but after my fabulous presentation on “why this is really kid-friendly” (complete with Tripadvisor testimonials), I won him over and we booked our trip. I’m not travel reviewer so I’ll get to the point on why this is WowMom approved: it’s the VIP service. The resort is truly catered to young families. We took our 8 year old son and 9-month baby girl…and yes, we had slight concerns about travelling with the baby but incredible staff at The Beloved ensured all was perfect during our stay. Our son cozily slept on the pullout couch, which always included his favourite Kinder Surprise chocolates with turndown service. Baby’s crib was set-up before we could even blink. High chairs were in abundance along with other happy little babies and toddlers. Even though we had our own baby food, we were always offered healthy choices for our little one, mashed or pureed as we wished. Now if only we could take this service home! Best was the 24/7 room service option. All parents can relate that going out to eat is not always desirable with a young crew in tow. Mornings were relaxed with breakfast wonderfully set up on our patio. We leisurely ate and never had to worry about our kids disturbing anyone. The VIP treatment extended to the beach as well. As my husband and son were off on their snorkelling adventures, I wondered how I would survive “stranded” beachside with the baby. Wow, I was wrong! Within minutes, someone was there to welcome us. Extra towels for baby & mama’s comfort? Check. Did mama need a drink? Check. Maybe mama needs a snack? Check. Does mama need another drink? Check. I never had to leave the comfort of my beach lounger. Baby and I enjoyed the shaded beach retreat and watched the waves roll in as the drinks poured in too. As a nursing mom, there were plenty of delicious non-alcoholic options to enjoy. The overall size of the resort made it extra family friendly. It was not an overwhelming mega resort so if we had to run back to our suite, there was no need for a trolley or a grand hike. Everything was conveniently close by. One of my favourite experiences was my mama’s little escape to the spa for some deluxe pampering. The spa itself was so beautiful that I had to fight the urge to drift away because I wanted to stay awake to take it all in! In the end, it was the little details that made our stay at The Beloved extra special. When our baby fell asleep in her stroller at the beachfront resto, towels were brought to lovingly shield her from the evening breeze. There were probably many other things too, but I blame mommy brain for not remembering. All I know is that it was a true getaway in paradise for mommy and the whole familia.